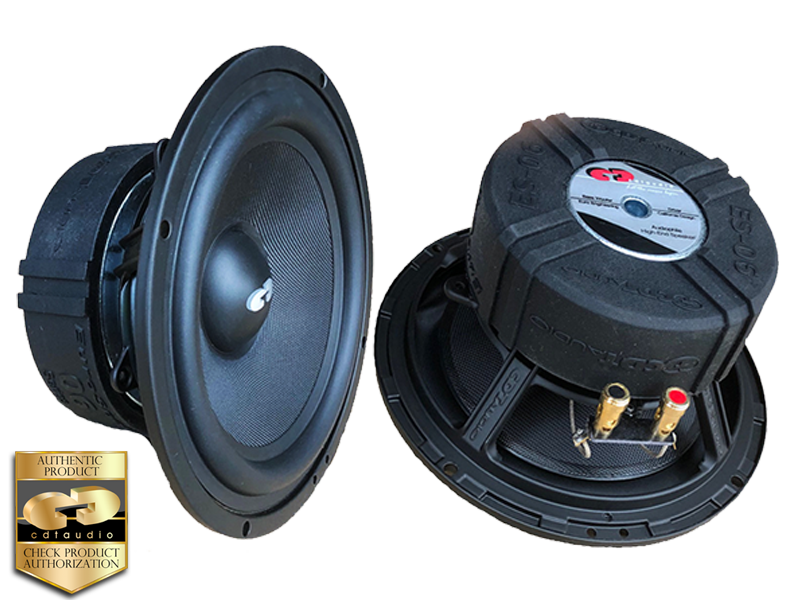 The ES-06 6.5" Enhanced Mid-Bass (cast frame) woofer has a slightly more massive voice coil than typical bass/midrange and leans toward the bass in the sound compared to the classic type woofer. The upper midrange is mellower than the standard type 6.5" midwoofer designs. These fabulously smooth, keval mixed fiberglass fabric, black coned beauties extract all the music and add no coloration to that sound. They start and stop on a dime for the most lucid recreation of the musical experience. From rap to rock they are on top, and the rendering of serious classical profundities is also exquisite. Utilizing a rubber edge and soft polymer dust-cap, these drivers create and absorb vibratory waves with astonishing control. A magnetic system utilizing a shorting ring above the pole piece lowers modulation distortion to new lows. The Fs of 54.5 Hz gives marvelous extension in compact situations. QES-670 has the smoothest response imaginable from a larger speaker. You lose nothing in smoothness by going up to this 6.7-inch speaker. With its extended mid-bass punch its size assures the sound has that authority audiophiles crave.